Republicans want Trump to declassify documents related to the Russia inquiry. A group of conservative Republicans on Capitol Hill called on President Donald Trump on Thursday to declassify sensitive documents tied to the investigation into the Trump campaign’s contacts with Russia, and make public others related to Bruce Ohr, the DOJ official at the center of their concerns about Robert Mueller’s investigation. “Mr. President, there are members of Congress and millions of Americans asking for you to declassify this information,” Rep. Lee Zeldin, R-N.Y., said at the news conference. “They have to be declassified, Mr. President, so we can lay out for the Congress and the American people the rotten basis for the investigations that continue solely to de-legitimize the duly elected president of the United States,” Rep. Matt Gaetz, R-Fla., said while also looking at the cameras. 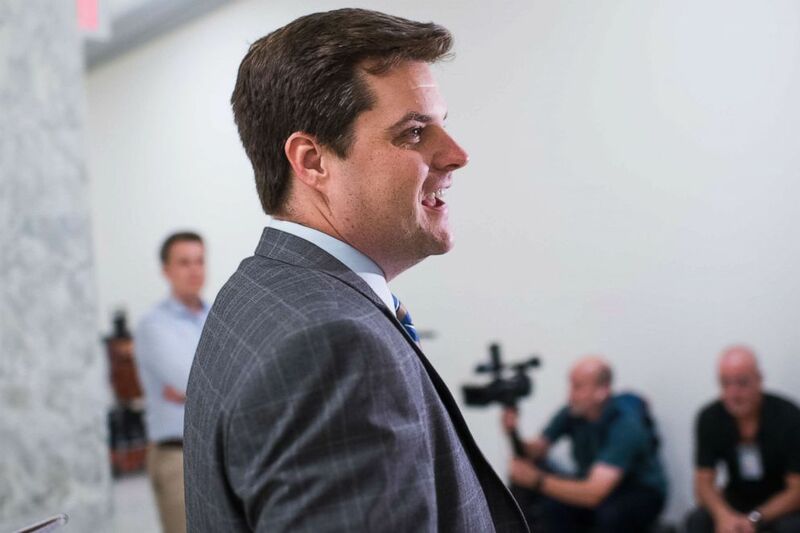 (Tom Williams/AP) Rep. Matt Gaetz, R-Fla., makes his way to a meeting of the House Judiciary and Oversight committees in Rayburn Building where Bruce Ohr was being questioned about alleged bias against President Donald Trump on Aug. 28, 2018. Specifically, the members want Trump to declassify and release more of the FBI’s foreign surveillance warrant application it sought regarding former Trump campaign adviser Carter Page, release summaries of the FBI’s interviews with Bruce Ohr, and what they said were additional “exculpatory” classified materials previously provided to top congressional leaders on Page and other Trump officials, although they weren't specified. While Republicans have accused Ohr of helping to legitimize the dossier of salacious allegations about Trump’s links to Russia -- and in turn, the investigation -- his first known meeting with the FBI was one month after the FBI's first application to the FISA court to conduct surveillance on Carter Page. The initial FBI investigation into the Trump campaign's alleged contacts was initiated months earlier in 2016 after an Australian diplomat informed the FBI that George Papadopoulos, a former Trump campaign adviser, had said that he believed the Russian government had obtained dirt on Hillary Clinton, sources with knowledge of the matter have told ABC News. The Justice Department declined to comment. Ohr's lawyer did not immediately respond to a request for comment. Trump, who has previously suggested Ohr be fired and stripped of his security clearance, tweeted earlier Thursday that he was considering “declassification to find Additional Corruption" after the New York Times published an anonymous op-ed from a senior administration official criticizing his tenure. Republicans on the House Oversight and Judiciary committees questioned Ohr for hours last week behind closed doors.